“Anyplace I Hang Myself Is Home” is I SPY’s origin story of how Scotty and Kelly met in Spy School. It’s an episode most fans of the series will enjoy. There is an intriguing setup that has Scotty seeing Rodin’s The Thinker statuary in San Francisco, and a series of mental visual flashes evoked by the image, and then Scotty startlingly walks in front of a moving car. The realization is that Scotty was trying to commit suicide! As with “A Room with a Rack,” Michael Zagor knows how to write an opening teaser. Ken Tobey, who was the star of the still well-regarded science fiction film The Thing, is back in the series as the most genial of Kelly and Scotty’s agency recruiter and current San Francisco supervisor. Scotty goes by his lonesome to take some photos of The Thinker, and freezes upon gazing at it. Apparently, Scotty has not watched any episodes of The Many Loves of Dobie Gillis in quite a while. Dobie was always sitting around an imitation of the famous statue, striking a pose similar to the sculpture, while delivering monologues on his desire for women. I covered Dobie’s fascination in this setting in an earlier Riding Shotgun column. Images flash onto the screen. Quickly edited. Almost too fast for the eye to totally grasp. Visual slashes accompanied by Earle Hagen adding a discordant theme behind them! Highly unusual tight editing for a television series, the tantalizingly unrelated images sends Scotty into an undeniable urge to kill himself. As Scotty recuperates in the hospital, Kelly and Russ try to discover what caused such destructive impulse in him. The examination of the history of Kelly and Scott takes them back to their days in espionage training school in San Francisco, where they were to attend a class reunion. Scotty tells Russ, from his hospital bed, of the day the two met. The screen cuts into a bleached image that abruptly takes back in time to that day. At least, Scotty’s version of spy school and meeting Kelly Robinson. As Scotty tells it, Kelly screws him over in a chess game against the man who has brought them into the spy business. Their meeting in the cafeteria has Kelly clumsily crashing his food tray into Scotty, and apologizing profusely for the accident, anxious and embarrassed. Later, Russ quizzes Kelly about how he met Scotty, and his version of the cafeteria scene follows. This time, inRashomon fashion, it is Scotty who crashes into Kelly, and is all over himself trying to atone for the accident. It’s fun to see the different scenes enacted two ways by Cosby and Culp. Henry Silva, notoriously known for playing bad guys, is one of their prime instructors, and I’m not giving away too much by writing that he has a lot to do with Scotty trying to kill himself, and Kelly eventually attempting to end his life by jumping off the famous Coit Tower. Henry Silva was a friend of Cos’ and also Buster Keaton. Eleanor Keaton told me that she and Buster loved I Spyand Bill would come visit them when he was in California. Buster was very ill at the time, and it would be in that time frame that the world lost Buster Keaton. Bill brought Bob with him to visit Buster. Both loved his film work. I suspect, like Boris Karloff, if Buster had not been so sick, they would have found a way to get him involved in an episode of I Spy. Two of my favorite loves together. Buster did get to do a Route 66. Eleanor Keaton told me, when I was doing the magazine to accompany showings of Buster’s films during the 1980s, that when Buster died, he left Bill Cosby his outfit from one of the most beloved silent comedies The General. Bill has it to this day. “Anyplace I Hang Myself Is Home” is pleasing on many levels. Personally, I would have enjoyed it more if it had happened during earlier episodes. Both Kelly and Scotty have been through so much psychological torture, I have a hard time believing that it would take this long for the suicidal implanted impulses to kick in. Oddly enough, another one of my favorite TV series, 77 Sunset Strip, also played with a Rashomon style of storytelling to regale the audience with how Bailey and Spencer met. There are three versions in “Once Upon a Caper”, Stu Bailey’s, Jeff Spencer’s and Kookie’s. Roscoe has a fourth, but Rex Randolph declines another subjectively told history. Despite my reservations, I still love seeing Bob and Bill do their separate versions, and even if I have trouble buying how this all comes about, the sequence where Scotty goes up into Coit Tower to get Kelly from leaping to his death showcases how beautifully the two actors, the two men, worked together. They were a beautiful, unique pair. Kelly and Scotty haven’t quite finished with the spy school system in San Francisco; they get bamboozled into training new recruits. In a game of “Tag, You’re It”, we get a tour through the “summer of love” in Haight-Ashbury. The game turns out not to be “touch” tag, more like a bullet through the head tag. Before Kelly realizes that the game is for life and death, we get to meet Leigh French as a fast-talking, flirty young woman who is not unlike the persona she would showcase on The Smothers Brothers Comedy Hour in just a couple of years. I Spy doesn’t ring falsely in its era of fashionable lifestyles, dress, and speech. Leigh has a great time falling into the pool and sputtering lines nonstop. It would only be a couple of years and she would be doing a parody of folksy talk shows with her as the host getting high on her brownies and tea, or whatever she baked and boiled on The Smothers Brothers. It’s great when Bill and Bob do their version of cosplay and blend right in with the area crowd of the time. I defy anyone to name a filmed drama show of the time period that captured the San Francisco Haight-Ashbury district right in the midst of what was becoming known in the media especially as the “hippie” and “drug culture” city center of the country. Bill and Bob saunter along the crowded sidewalks, as if they are an established part of the milieu. They look as if they could also be in the midst of a Sergio Leone spaghetti Western. The end of “Tag, You’re It” ends basically where it began, in the training grounds of spy students with the Golden Gate Bridge in the background. The “Tag” has now become the “tackle” to bring the hide-and-seek-and-kill game to an end. It’s only fair to take the guy out any way you can, and with prejudice, if he has framed you for murder while trying to murder you himself. As I Spy heads toward its final episodes, no one at the Network questions any more if a black guy can slug a white guy. Or question any more if a black man can defend himself. Oh, and also, win the fight. People may have forgotten how much travelling I Spy did, and it wasn’t just around the world taking picturesque photos. Kelly and Scotty head up into the hills and woodland of a small California town, isolated from the big cities. The small town has its own rules, its own way of life. It doesn’t like outsiders. It is vehemently against the Government wanting to build a nuclear plant nearby, to the extent that the Government representative advocating such a thing is murdered. The Government did actively send people into communities in the mid-’60s to try to get them to sign petitions for nuclear plants in their neighborhood. I recall someone coming to the door of the house I owned that was two blocks away from the ocean, seeking to get everyone to put their John Hancock’s on their forms. The acronym NIMBYs had not yet been coined. The hazards of nuclear waste plants had not really reached public forums much. No one ruled the area I lived in to my knowledge, but then I wasn’t much of a participant in the neighborhood. I was already travelling to New York much of the time, peddling my stories and experiencing New York City for the first time. I was not going to comic book companies. The town movers and shakers decide to teach Scotty and Kelly, the two interlopers into their countryside paradise, how unwelcome a committee they can be. The thugs taunt them. They batter up their car. They break Kelly’s tennis racket. They suggest the newcomers leave town sooner than later. Kelly and Scotty watch. They don’t say much. They will have their moment with some of these thugs who work in a gang and not alone. The hostility escalates. Scotty and Kelly learn from the waitress at a central restaurant in the town that there is a clandestine meeting that night. She has an older brother, Tiny, who is slow-witted, but huge in size. Richard Kiel from the Bond movie The Spy Who Loved Me played Jaws, so you know he’s big. Kiel was also Dr. Loveless’ giant bodyguard in The Wild, Wild West. It is also intimated Tiny is slightly racist when he doesn’t want the waitress’ young daughter to lick an ice cream cone Scotty has bought. Andrew Duggan is the head town council, and he leads with an unsubtle intimidation to his constituency. And to anyone different or outside his personal beliefs. He is in control, except at home, where his wife intimates he is impotent and he cannot control her. Andrew Duggan will always be Cal Calhoun from Bourbon Street Beat for me, the New Orleans based private eye series from Warner Brothers. One of those shows still lost to DVD because of music issues. When Kelly and Scotty check out the late night rendezvous, which has the feel of a Klan meeting, they find they were set up, and are set upon by members of the committee, pelting them with stones and rocks in the dark environs. The next day when the two stop to fill up their car at a gas station, the attendant sneers at them and makes snide reference to the “stoning” they received the night before. Scotty and Kelly have been driving out from the tanks when the jeer comes to them. The car stops. Kelly and Scotty choose odds and evens, to see who gets the pleasure of giving back a little of the lumps they took the night before. The setup is Culp and Cosby beautiful. As the mechanic looks for a tire for them, Kelly slowly readies himself for the fight while Scotty views from the sidelines. Carefully, Kelly takes off his watch so it won’t be damaged in the upcoming fight. Robert Culp may not be doing kips and leaps and loose-limbed vaults; it doesn’t mean he won’t display a neat set of spins and kicks. It’s an impressive display that leaves the mechanic wishing he’d kept his mouth shut. I suspect through the painful beating, he has forgotten the sadistic glee he got from throwing rocks at other human beings. When the reveal occurs towards the conclusion, Scotty has to face off against Richard Kiel, as torches flare, illuminating the big man, Tiny’s, brutal backhand to the agent. Another visual intimating Klan type endeavors, of burning and savagery. The combatants are surrounded by an audience, as if at a blood sport. It will all be changed within moments, the mood of anticipation of bruised flesh and battered body. “Happy Birthday, Everybody” is scripted by Mort Fine and David Friedkin, though outside of a ticking time-bomb scenario in a Donald Duck piñata that will explode on impact, there is no distinction of colorful characters that often appear in their efforts. I have included it here because Gene Hackman makes one of his few television appearances, and Jim Backus plays the judge Gene wants to blow to hell and gone. Except for Donald Duck and Cos and Culp, its distinction is the location photography and Popeye Doyle meeting Mr. Magoo. Although, come to think of it, Hackman and Backus actually don’t have any scenes together. I wonder how they got Hackman for this part. It’s certainly a routine television drama villain from this time period. Here is Gene Hackman planting explosives that will blow up Jim Backus and his family when the son whacks the Donald Duck piñata. Could you actually get away with using a Disney character is such a fashion today? Bill Cosby and Gene Hackman do get to square off against each other in a picturesque locale, one of the few saving graces of the episode. “The Name of the Game” is I Spy’s version of Richard Connell’s The Most Dangerous Game, that was filmed a number of times, including with Richard Widmark in Run for the Sun. The essential plotline is used in many action television series over the years. The protagonist of the story is being hunted down by another human being and/or band of human beings. Anyone with a love for Pop Culture, for books, movies, comics or TV shows have encountered some form of this narrative. The premise works especially well for I Spy. The on location photography helps create a believable visual area for the hunt to take place, for the show purposes an island off Acapulco, but it also showcases Scotty and Kelly side-by-side in a life-threatening game of mortal consequence. It is a visual display of the steadfast friendship and loyalty displayed in their easy banter through-out the series; its unique mainstay of chemistry between C & C (Cosby & Culp, or Culp & Cosby, the order doesn’t matter). Even though the show is nearing the last episodes that will be made, its backgrounds are still magnificent. The Acapulco locations are a last minute substitution because Sheldon Leonard had planned to film in Russia and China. One would be hard put to state that Sheldon was nothing if not ambitious in his desire, although relations with both these countries was less than stable in the 1960s. The scramble was on behind the scenes when Russian and China plans fell through, and scripts were hastily being written to take place in Mexico and environs. The psychotically deranged, forcibly retired General who is due to have a visit from his old friend, the President of the United States, prompts the agency to send Kelly and Scotty to check to make sure the General’s security is safe. They try to ingratiate themselves with the General (played by Lloyd Nolan, who was the first actor to play Mike Shayne, Private Eye in the movies). Nolan can give a disarming smile, but is also capable of a steel glare coming into his eyes, and a countenance that turns harder than stone. Once Kelly and Scotty are out of his sight, he takes the woman he has been escorting to a scenic view where local divers plunge off high cliffs into the ocean, for the tourist’s gasps, and for their economic donations. The General knows the woman has sold him out to Kelly and Scotty. He uses his riding crop to send her over the cliff edge, not into a dive into deep waters, but a bone-crushing death on the rocks below. Within about five minutes we already see how ruthless he can be, and that human life is easily expendable to him. On the General’s isolated island, Scotty and Kelly learn just how unhinged the General is. Like many people ranting on Facebook, he knows the way things should be run, he knows how his views have been disregarded, but rather than a rant delivered on a social network page, he puts his ideas to physical reality. The physical reality is put upon Kelly and Scotty, who are given a head start before the General and his entourage begin to hunt them down. It is a case of survival, of Darwinian proportion, if one believes in that sort of thing, that only the strong will survive. Kelly and Scotty do whatever they have to do…to survive. That, in essence, is the basic theme of every well done The Most Dangerous Game scenario. The rules may change; the hunter may lie, cheat, taunt, but the challenge is to stay alive. All kinds of hunters, traps, and weapons are used. Kelly and Scotty fend off attacks with machetes; the General not far behind his point men. Scotty is wounded. Blood flows from a wound that severely cripples him. He wants Kelly to abandon him. His friend has a better chance at survival alone. This is where Cosby and Culp once again move with ease, showcasing that which transcended traditional television, the two men aligned with each other, each willing to give their lives for the other. The race of each doesn’t enter the equation. Scotty, virtually unable to walk any further, lying on a desolate beach, fires a commandeered crossbow at one of their pursuers. Three years ago, when the series began, the action would probably have been questioned and debated. Could a black guy defend himself, and shoot someone, with bullet or arrow? I Spy had changed that forever. Kelly hasn’t had to do anything with swords since “Tigers of Heaven,” so here is one last duel with swords, on a stretch of beach, sand waiting to soak of blood before the tides come in and wash away the remains of war. I had to include, “Shana,” one of the last I Spys. Gloria Foster (who many comics and film fans would recall decades later from The Matrix film series) is a bitter woman who has stolen experimental rocket fuel and hopes to trade it in exchange for her brother to the Communist party, represented in this case by the man who paints her (Albert Dekker, the original Dr. Cyclops, hunting down miniaturized human beings). The location work is still beautiful, as you can see from this still, as Scotty tries to warn Shana to stay clear of the doctor. We have not seen as angry a black woman on a TV drama series as Gloria is here as Shana. She distrusts with vigorous intensity; she feels betrayed by her government, and its lack of humanity where her brother, his human life, is concerned. One of the prime reasons I wanted to include “Shana” in this long love letter to I Spy is to showcase once again that while it could be light-spirited, and showcased the onscreen chemistry of its stars, it also could bring a grim reality of how Governments work. Both Scotty and Kelly know Shana is going to be tortured for what she has. The Government, for their own agenda, does not want them to intervene. They are under orders to let her private inquisition commence, no matter how brutal it is. The two chafe under the restrictions. I cannot think of another American TV spy show that comes anything close to this callousness of disregard, to get the mission done. Secret Agent aka Danger Man in England certainly under Patrick McGoohan’s discerning command might, but in Hollywood, in a state-side produced series. Not bloody likely. I can’t reveal how it all comes out. I hope all of you who have read this have found it fun, provocative, informative, and given you a sense of what I Spydid WHEN it did it. It is seldom a TV Series finds a third outlet on DVD. Whether you find it from Image, in their four episode DVD packages, or on their separate seasons discs, with the commentaries by Robert Culp on the episodes he wrote, or here released with all the episodes, but minus Bob’s masterful subjective behind-the-scenes memories) I hope you’ll have an appreciation for the show, for Bob and Bill, and have the series as a part of your own experience. I started with this series entitled “I Spy: Love at First Sight – The First Television Stars to Read Comic Books on Television”. Thanks to Tatia Loring we have shown you clips from the show of comics being read. Here Robert Culp is reading one of the comic books done on I Spy. During the times Bob and I were together, or talked on the phone, I never thought to ask him if he had ever seen the I Spy comics. However, remember, in 2014, don’t even believe what your eyes see. Tatia has worked magic with this photo. To my knowledge, Bob may never have seen these particular comics. Here however is a photo with no trickery, taken on board the Queen Mary, before we went on stage. Bob and I both loved comic strips. One of the things I have written that I am proudest of is the Zorro Newspaper strip, drawn by Tom Yeates and Tod Smith. It was great being able to share the strip with Bob when it was published in book form by Image. In case some of you comic book aficionados are skeptical about Robert Culp’s love for comics, here is the cover for his script based on Milton Caniff’s Terry and the Pirates. The kid from Rhode Island would never have believed you if you’d told him Bob would ask him for his thoughts on his script. And once, when we were in a Hamburger Haven on the West Coast, along with Marsha, Rob, Lauren and Gilbert, during the time period I was doing “Panther’s Quest” with Gene Colan, Bob was working on his big screen version of I Spy. 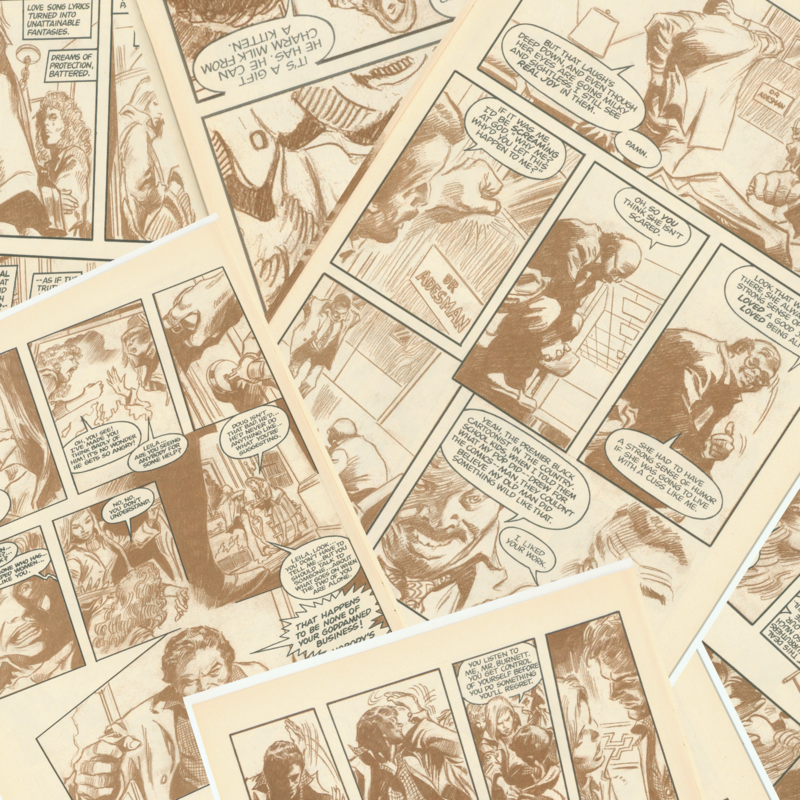 He asked me if I would write the comic based on the script, and could I ask Gene Colan to draw it. He was already thinking that far ahead. When Warners read the script, they realized I Spy was not a Lethal Weapon clone, it was a more serious examination of how government agencies work, and what it costs the people who follow those agendas. Bob and I talked about it sometime later, after he had finished the script. When I asked him for their reaction, he was succinct. But it would have made one helluva curtain call movie for Kelly and Scotty. The biggest I Spy forum on the internet is here, and without Tatia Loring, this Riding Shotgun piece could never have become the in-depth, visually elaborate I Spy celebration that I wanted to do. Part One: “Robert Culp – A Volatile Talent in the Electronic Wasteland”. Okay, I love I Spy. You all know that from viewing this. 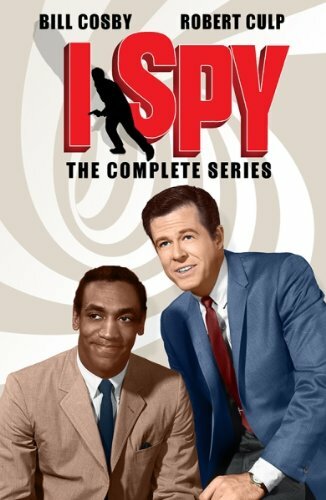 One of the best books ever done on a television series is Marc Cushman and Linda LaRosa’s I Spy: A History and Episode Guide to the Groundbreaking Television Series. People often asked me over the years if I would write an I Spy book. I could never have done one as all-inclusive and well researched as this one. You can find the book here.